Spoilers for The Walking Dead are below. Run upstairs if you haven’t watched. Tonight’s midseason premiere of The Walking Dead brought out a lot of the things that the horror drama does best. A small town’s worth of walkers got slaughtered, an awful character bit the dust, and a door to one arc successfully closed while inspiring a yearning to open the next one. 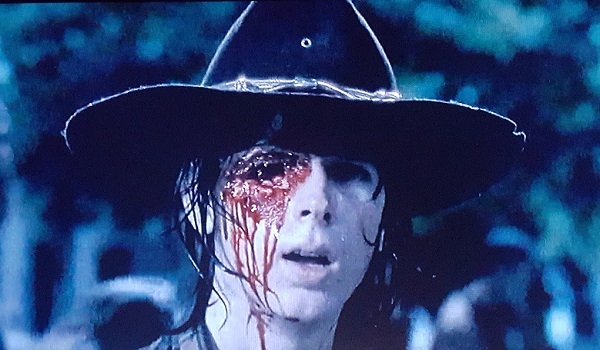 Oh, and Carl Grimes got shot in the face. I’m calling it his Eye-des of February. Many of The Walking Dead’s biggest brain-busting moments involve someone getting killed, and the episode’s no-turning-back sub-climax did involve people dying – R.I.P. The Anderson clan, we’re glad we hardly knew ye. The most crucial portion of the scene wasn’t about a death, though, but merely a bleeding crater in a still-living person’s skull. Carl is one of the few characters on this show that has been there from the very beginning, and while his existence has had an enormous effect on others (usually for the worse), he hasn’t really been made to run the gamut of suffering in all these years. That streak ended in “No Way Out,” though, and it was damned satisfying when the heir to the Grimes kingdom slowly turned around to reveal that Ron accidentally got both his revenge and several points for marksmanship. As a comic fan, I have no idea what it was like for Walking Dead viewers who were clueless that this was coming, and I couldn’t be more jealous. As gratifying as it was to live through Carl’s live-action head wound after anticipating it for years, I’d love to know what it was like to have been taken aback by it. This manic series of events didn’t really play anything solely for shock value, but instead a point was made to stretch out time in showcasing just how devastating a situation can get in just a few errant seconds. (And everything involving Sam the Ruiner of Everything felt like an eternity anyway.) Sam’s freak-out episode led to walkers swarming first him and then his mother Jessie, whose arm became a target for an instantly mournful Rick “Hatchet Magic” Grimes, which led to the firearm-nabbing Ron attempting revenge before getting impaled by Michonne’s sword. That’s a lot of moving parts, even without everyone else in the scene being there, and Carl’s bullet-torn face was a powerful punctuation mark. Carl’s survival isn’t really an issue here, and I was genuinely more worried about Abraham and Sasha in that opening scene. No one is looking for another Glenn-ish controversy here, and the young lad still has quite a bit of story to burn through, if he sticks to his comic roots. But getting shot in the face is a serious enough issue even in perfect conditions, and there isn’t much perfection to be found in a post-apocalyptic community lacking a team of surgeons using top-of-the-line medical equipment. Denise, who just went through a kidnapping, is the best candidate to save him; also not ideal. But he’ll make it. Just like Rick will. I can’t say that they won’t both be changed forever, though. There’s a time jump coming to the show soon, which could likely be used to speed up Carl’s healing process some. Carl is a dude I have openly railed against and trash-talked for years, yet I’m uncannily invested in how Chandler Riggs’ performance will change as things go forward from here. I’m not going to say the character became a posterboy for super-awesomeness in the comics after he lost his eye, but it instantly ushered in maturation and a semblance of Martin Riggs-like bravado. Cheers to a more hardnosed Carl Grimes in 2016 and beyond. What Did You Think About Carl's Injury?